The Libra and Aquarius in love a romantic relationship will be able to heighten and strengthen their knowledge. They will bond on a very high mental level. They will both love art, people, and culture. Neither will like having a restrictive influence in their life. The Libra and Aquarius soul mates will likely work well together because they will have comparable needs. They will not demand more of each other then they are willing to give. They will both have a lot of energy and excitement. They will have a compatible relationship that is not likely to be boring. The planets Saturn and Uranus rule over Aquarius. The planet Venus rules over Libra. Saturn is about karma, Uranus is about rebellion, and Venus is about love. The planets will mix their influences to make an interesting and productive relationship. In the Libra Aquarius compatibility, both should definitely work on other projects together instead of just their romantic relationship. They can make great things happen. They will both want progress, and they will use their hearts and their knowledge of the greater good. Libra and Aquarius couple will work well together for social justice and radical change in the community. Aquarius and Libra are both Air signs. They will have strong intelligent connections to each other. They will continually stimulate each other’s ideas and communication styles and skills. They are more than capable of working together. Because of this, they will need to work on bigger projects in their life together. They should both be concerned with the greater good. Libra zodiac will be able to bring a kind of balance to projects that almost no other zodiac sign will be able to accomplish. This Aquarius and Libra relationship will be full of stimulating and intelligent discussions about their different interests and pursuits. Aquarius is a Fixed sign and Libra is a Cardinal sign. The Libra man or Libra woman will be able to start things, but they might have trouble finishing them. The Aquarian will give a positive determined influence. They will have a lot of follow through. They can take Libra’s ideas and carry them through until they are completed. They will work well together. They are not likely to disagree about who should do what. They will not argue about who takes credit and who works behind the scenes and who will work in the center of attention. In the Libra Aquarius compatibility are both concerned with improving the world and the people around them. Aquarius star sign is the most progressive thinker of the zodiac. They will think of new ideas and will always be working on them. Libra sun sign is the diplomat of the zodiac. They do not like arguments of any kind. They will be able to balance their relationship. However, Libra not liking arguments but loving intellectual freedom can make them somewhat indecisive. Aquarius is more decisive. They will be able to help their partner make a decision. Aquarius men and Aquarius women can be idealistic thinkers but reality will ruffle their emotions. The scales sign can help smooth out their emotions. The best thing about the Libra Aquarius love compatibility in a romantic relationship is how they are able to work together as a team. They can learn a lot more together than either of them could on their own. Their achievements and sociable natures and new projects will make this Libra Aquarius friendship successful. The Libra dating an Aquarius will be an airy and intellectual relationship. They will have a lot of the same interests. They will both want to make the world a better place. They will definitely meet on a mental level. They will both find intelligence very attractive. Because of this they will have physical chemistry. The visionary and the idealist are both seekers of the zodiac. Libra Aquarius in bed might be too intelligent for a passionate relationship. Libra compatibility with Aquarius will have a good start. They will have a lot of discussions. They will have a lot of appreciation and respect for each other. They will both enjoy a good debate. They will discuss everything from the mundane to the strange. The Libra personality will be looking for an ideal partner. They are the idealist of the zodiac. They are very open minded. They will not mind. Aquarius is the visionary of the zodiac but can be eccentric. Because of this they will be focused on progressive issues and their excitement for the future. Aquarius personality is probably the least romantic of all the zodiac signs. They will find the Libran’s mind attractive. They will be willing to give up some of their valuable independence to stay by their partner’s’s side. Aquarius and Libra marriage will work well together in a sort of distant kind of way. Neither zodiac signs will be likely to suffocate each other. 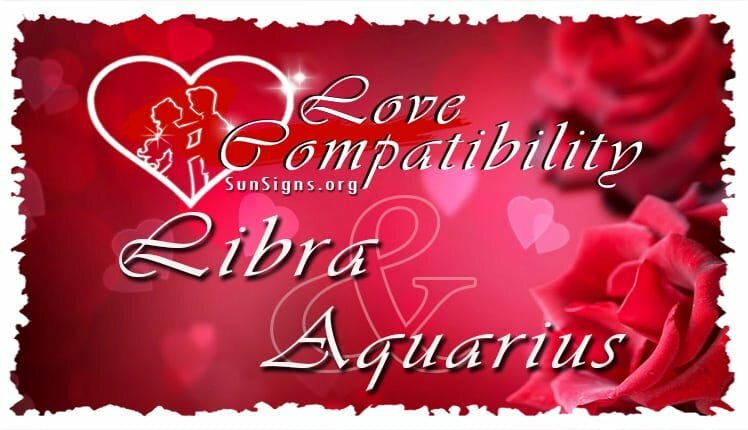 Libra Aquarius love compatibility will be perfect together in a business relationship or as friends. However, these two star signs might not be compatible because they have common values and good conversation. It will take more than that. Libra born can be adaptable so they will not mind the Aquarian being emotionally distant for a while. However, eventually they are going to need to be reassured that they are loved. The water bearer will need to understand that just because they might not need this, Libra will need it from them. They will need to be able to give the Libran some loving attention. If they are able to do this, the Libra Aquarius relationship will easily develop. Libra is not clingy. Because of this, there will not be anything that will hurt Aquarius’ freedom. The water bearer will be more likely to put down roots on their own instead of being forced into it. The Aquarius man in love or the Aquarius woman in love will put some emphasis on how important they find intelligent pursuits. Libra being compatible will work best on a mental level. A relationship of two air signs that are in love will be very creative. They will be more than able to stimulate great ideas and a lot of excitement in each other. Venus is romantic. The influence of Venus will help gentle Libra be able to show Aquarius how they can show more emotion than they ever thought they could. Uranus is rebellious. The influence of Uranus will help Aquarius be able to show their partner that it is okay to take a chance and make a decision. Otherwise the Libra and Aquarius will breakup. Libra and Aquarius being compatible in a romantic relationship can have a lot of benefits for both of them. They can both learn a lot from each other. They will work well together in their everyday life. They are both very sociable. They will both find other people interesting. Because of this, they will likely have a wide and varied group of friends. However, neither sun signs will be rational. They might have trouble with the daily duties. At the same time, they will both be able to find humor in their common weaknesses and will find a way to work through the mess. Libra is a cardinal sign. They will take control in the relationship. Aquarius will follow at a distance because they do everything from a distance. Aquarius will be happy to follow as long as their freedom is not hurt. Aquarius and Libra might test their compatibility when the water bearer is too stubborn. Libra is the diplomat of the zodiac and they will find a way to solve their trouble.